How long does it take to walk from here to there? is a fairly straightforward question that crops up often enough. Providing duration times of journeys on foot, was the common sense answer that came to urban planning student and would-be pedestrian activist, Matt Tomasulo, from Raleigh, North Carolina in the southern United States. 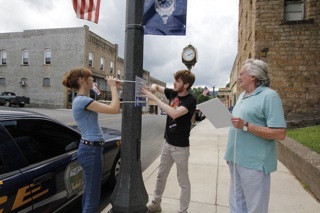 His answer to this common question was to devise a set of signs that not only gave direction but duration for journeys on foot, and set about putting them up around Raleigh. 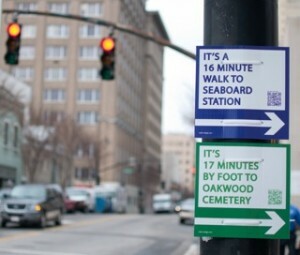 What if these guerilla signs could be made available to anyone, anywhere? What if anyone could make some of their own? This entry was posted in Activist, Transport professionals on June 28, 2014 by admin_TW.